MERISH 4 is a backing track player designed for 'ALL' musicians. Solo performers, duo's and trio's using backing tracks can perform and 'react' like a live band! Live bands can 'beef up' their sound by using Merish 4's instrument group control to mute out parts played by the live band and keep brass sections, orchestra and keyboard parts. All this without even editing the backing tracks. Merish 4 even has a click out with count in to make it really easy for drummers to sync in. WATCH MERISH 4 IN ACTION ! 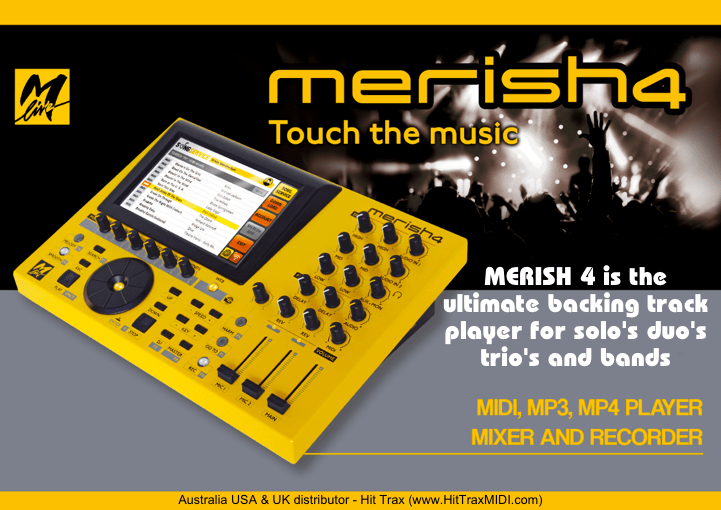 Merish 4 backing track GIG workstation with 15cm x 9.5cm touch screen and mixer. Merish 4 supports MIDI Files, Mp3 and Mp4 Video with text. Merish 4 includes a powerful digital mixer with 2 mic inputs and effects, harmonizer/voice double tracker and equalizer. Other great features include Audio Recorder, Midi File Editor, expander keyboard or other peripherals. 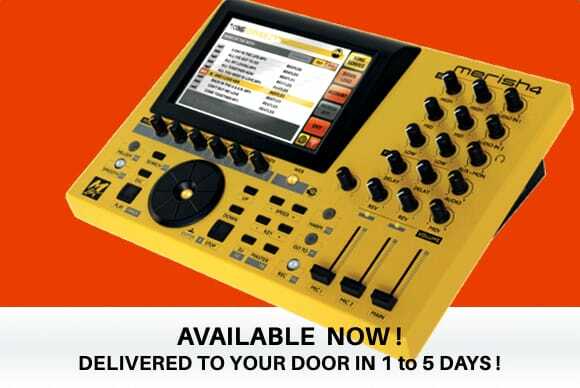 The onboard MIDI sound engine 386 sounds, 46 Drum kits with 480 samples. Set Backing Tracks, Guitar and Mic levels for typical solo/duo performing act. Connect Mic to MIC 1 and sing into mic. Slowly turn up MIC 1 GAIN knob on the rear panel and watch the GREEN LED light above MIC 1 slider (under the REV knob). Start singing at your loudest voice level and stop turning the GAIN knob when the LED enters RED. Now sing at normal voice level and the LED should remain in the GREEN zone and occasional Yellow. This is the ideal input level. Set the MAIN slider on MERISH 4 so the top of the slider rests the 4th bar from the top (about 85% up). This method should provide the optimum sound from your MERISH 4. It’s okay to experiment a bit with the OUTPUT levels to get a mix that suits your particular act. The INPUT levels should be adhered to. * M-Pen is not included with export models. All M-Pen functions can be achieved in exact by connecting a standard USB cable between Merish 4 and a computer. This results in a substantially lower price on Merish 4 with no loss of performance. There is also the matter of service and support for M-Pen which this distributor is unable to provide due to the proprietary design of the attachment. Therefore in the best interests of our customers, we made the decision to omit M-Pen from export models. * BUYERS OUTSIDE AUSTRALIA: : In most instances, no duties, customs fees or additional delivery fees will apply to your purchase however please be aware that on occasion and completely beyond our control, duty, customs fee or delivery fee may be charged to the buyer by relevant authorities and courier service. Hit Trax cannot be held responsible or liable for these costs. Buyers accept full responsibility for fees charged over the stated price on this product page. Merish 4 has a 7 day at home satisfaction period. If not satisfied and you wish to return the device, the following conditions apply. Please note before purchasing this item that all points below must be satisfied by the seller for a refund to be effected. Seven day period begins from the day the item is received by the buyer. Buyer must inform Hit Trax of intent to return item before sending. Buyer must receive a support member response (not an automated 'receipt of e-mail notification) which includes the return process details and a return authorization number. Hit Trax will provide return details within 3 working days. Buyer must not initiate a charge back or payment dispute during the return process. The item, including outer and inner box and inclusions (including but not limited to user manuals, power supply and leads) must be returned in 100% original and new condition. These items must be in the box. If any item is found to have wear or damage, no refund will apply. If any of the song files on Merish 4 have been copied (the device will flag any copying), or deleted from the device, the refund will be cancelled. Do not return if you have copied or deleted any of the 1000 songs off the Merish 4. We will not refund if the songs have been copied or deleted. You must pack the item carefully and ensure there are no moving objects such as the power supply and loose objects that can damage the screen if not secured. The cost of parts and labour to fix and replace damage from moving parts will be deducted in full from a refund.